Today, I’m visiting the “Memorial to the Murdered Jews of Europe,” (often referred to as the “Holocaust Memorial”). I have mixed feelings about visiting memorials like this one. The mixed feelings don’t arise from thinking I ought and that I ought not to visit – they comprise feelings of wanting and not wanting to visit. The wanting comes from two places. First, it comes from wishing very much to gain a fuller understanding of the facts surrounding the events of the Holocaust. I want to know more about what happened in Europe between 1933 and 1945. Second, wanting to visit memorials and important sites comes from hoping to understand why it happened, or at least to get a few hints about why it happened. There is, of course, no bumper-sticker description explaining how millions of non-evil people were brought to a point at which they’d contribute to or commit evil acts so heinous as to defy comprehension. This gets at the competing side of my mixed feelings about wanting to visit: what bothers me most is that people just like me and every other average person in America were brought somehow to commit acts so terrible that we use the amalgamated product of their behavior as the clearest example of evil in human history. There have been other, perhaps more evil acts (the Gulag system in Russia immediately following the Holocaust, to take one example, or the American Institution of Slavery for another), but we point to the Holocaust first because it’s most-universally recognized in America to be the clearest example of evil. I am afraid of my reaction to realizing that people just like me were brought to do terrible things that are almost too abhorrent even to imagine. I’m also afraid of my own emotional and psychological reactions to contemplating the atrocities committed by the Nazis and their complicit or implicit supporters. I make my way on the U-Bahn from Alexanderplatz to Potsdamer Platz. It’s raining, which seems fittingly dreary for the somber occasion of the day. I always get turned around when I come out of U-Bahn tunnels in the middle of round plazas, but I right myself after finding my way into the ultra-modern Sony Center, which I’m happy to leave as soon as I’m able. Beyond Hannah-Arendt Strasse, the Memorial is split into two levels: at ground level is a field of coffin-shaped (but variable in their height) stones called “stelae”. They’re arranged in rows and have gently undulating walkways beneath them. When I find my way downstairs, I pay for the audio tour and am profoundly moved by the exhibit. It is personal. Rather than a presentation of numbers alone, much of the exhibit regards the effects of the Holocaust on individual people’s lives. If only we had such resources for those who perpetrated the atrocities, we might be able to prevent it from occurring again. This was today’s most important site for me. In keeping to my 500-word limit, that’s all I’ll say here. 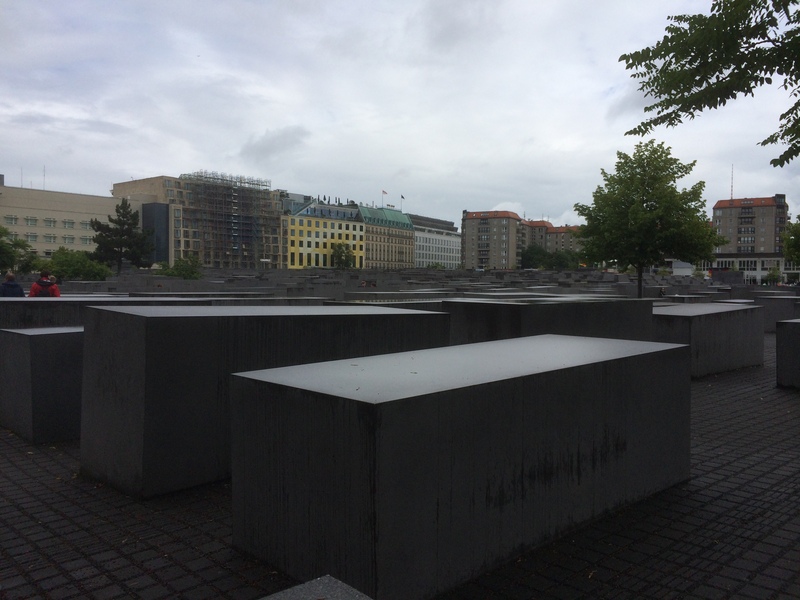 This entry was posted in Travelogue and tagged Atrocities, Berlin, Culture, Doubt, Evil, genocide, germany, Holocaust, human interaction, Human Nature, Human Value, mass murder, travel, Walking. Bookmark the permalink.